In our first year of shipping Realm, we’ve been absolutely thrilled at the wide variety of apps adopting our technology. Banking apps, shopping apps, comic reader apps and even police apps — the types of apps using Realm are wide and varied. That being said, none of that can compare to one of the latest apps using Realm: a t‑shirt enabled augmented reality Japanese superhero photo app!!! Coming straight out of Japan, Bandai Inc has released NEXTPETS! 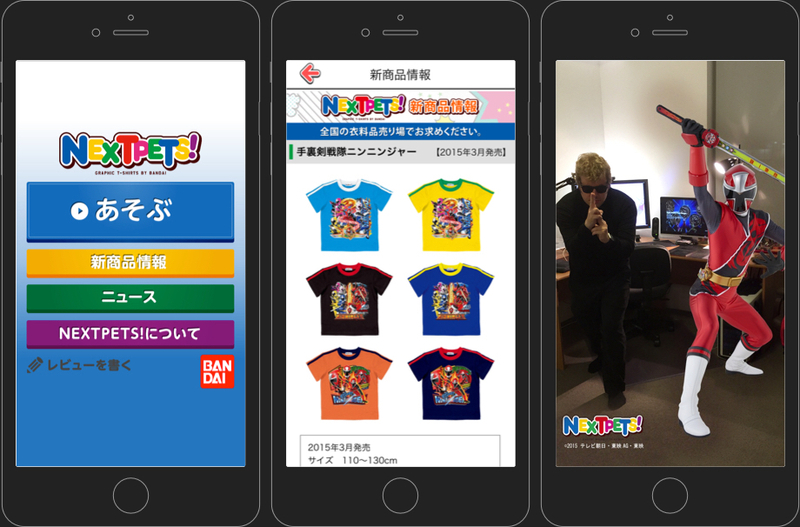 for iOS, which serves as a digital complement to their graphical line of T-shirts featuring many of Japan’s favourite superheros, including Kamen Rider, Ultraman, not to mention the famed Super Sentai. When you don one of these T-shirts and scan the front of it with your smartphone, your favourite hero will burst forth from your screen, ready to be photographed by your side! Having grown up in the 90s, many of us at Realm have fond memories of watching Power Rangers on TV, and we’re absolutely blown away that the genre has adapted with current technological trends to produce awesome stuff like this. Seriously. It’s an app where you scan a superhero t‑shirt. In comparison, the best that we had was Barcode Battler! In any case, we’re absolutely honored and humbled that Bandai, a company with such a long and prestigious history, has chosen to use our technology in their latest app. We can’t wait to see what they do next!